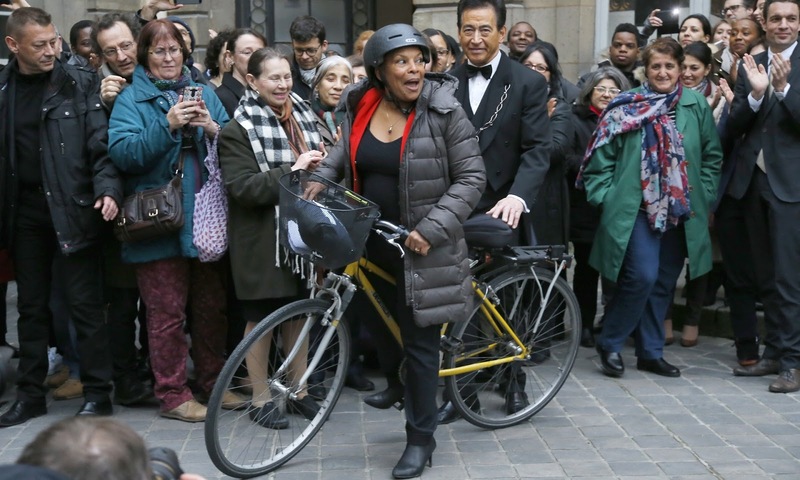 Christiane Taubira ready to zoom off, but not into the sunset. I love Christiane Taubira. If she appeared before me like Yemaya, or the Virgin Mary, I'd fall at her feet. The French Republic has rarely had such a staunch and principled defender. As an elected deputy of the French parliament, she was the driving force behind a 2001 law recognizing slavery and the Atlantic slave trade as a crime against humanity. François Hollande's French Minister of Justice since 2012, she spent months introducing and defending the 2013 law that would give lesbians and gay men marriage equality, and establish her as one of the most hated targets of the extreme right. She didn't care. Every day during the battle I'd wake up and check out YouTube to catch her latest impassioned speech, or snippy response, or even extended fit of giggles. She took the fight personally as a black woman. And said so. Equality was equality to her. And she'd been fighting for it her entire life. In France as a young black student newly arrived from her birthplace of Cayenne in French Guiana. In Guiana fighting for the cause of independence. Now, faced with having to defend proposed legislation which actually attacks equality, she's walked away from her post, denouncing the antiterrorism measure that would strip convicted terrorists of French citizenship if they are dual nationals, even if they are born in France. While it may seem like a small, symbolic gesture, that would almost never be applied, it is part of a Constitutional reform that will institutionalize inequality, officially creating two classes of French citizens. There are those who have citizenship permanently and irrevocably--mostly white French people born in France into white French families. And those whose citizenship is theoretically vulnerable--mostly immigrants and the children of immigrants who also have citizenship in another country. This act can only exacerbate existing racism, xenophobia, and anti-immigration sentiment at a moment when all of Europe is grappling with a huge swell of refugees. And citizens of color in France, including North African Jews, are already considered not quite French. Most importantly, here, where Equality and Fraternity are two of the three pillars of the French Nation, along with Liberty, it also undermines what it means to be French. Like the U.S., France has never quite lived up to its ideals. But the average French person still believes in them, at least in the abstract. And when social and legal change does happen, some aspect of liberty or equality or fraternity will be the underlying argument. I can't imagine France without them. Will it be converted into a U.S. post-9/11, cynical or indifferent to vanishing civil liberties, secret prisons, a parallel justice system with its own Guantanamos, endless surveillance? I saw the Spielberg movie Bridge of Spies during the holidays, and especially liked that scene between a Cold War spook and Tom Hanks who plays Brooklyn lawyer James Donovan defending an accused Russian spy. The CIA guy wants him to share confidential information, and tactics. And Donovan goes all Constitutional on him defending the right to a fair trial for everyone, and asking just what it is Americans have in common, anyway? Especially Americans like them, Donovan, the child of Irish parents? The spy guy with a German name? Donovan answers his own rhetorical question by saying that nothing at all unites Americans. Just a few abstract ideas, a few principles. Like Equality. Especially equality under the law, a competent defense. For everyone. It was eerie to watch the movie here in Paris just a few weeks after the November 13 attacks when people were still lighting candles and laying mountains of flowers in front of the cafes and restaurants and clubs where hundreds of men and women were slaughtered and maimed by ISIS terrorists. People were still afraid. The streets were half empty. Tourists had cancelled their reservations and many Parisians were avoiding cafes, especially the terraces. You could get a seat anywhere. Also, Hollande had just made his big speech to the parliament with his ministers there in the front row. I saw Taubira listening as he tried to counter fear and grief with strength and anger, condemning the attacks. And of course, laying out his anti-terrorism measures, which included declaring a state of emergency, possible Constitutional reforms, and this provision to strip nationality. When he said that, I thought I saw Taubira's face close in on itself. And afterwards, when she joined the whole room singing the Marseilleise, I wondered what that call to battle meant to her. Now I know. A portion of her parting tweet was, "Parfois résister c'est rester, parfois résister c'est partir..." "Sometimes resisting means staying, sometimes resisting means walking away…" She'd stayed for months trying to fight the provision. But having failed, she couldn’t stay, and offer her seeming approval. Already, she's published a book-length essay against the legislation. She may have left the government, but she's still fighting for France.